After you’ve valued your deals, you can easily share them with your contacts and other parties on your deals. Easily add contacts to your CMBS account. Import contacts from Excel and major email and contact management platforms. Share deals with your contacts and other parties. All you need is the person’s email address. Allow read-only or read-and-edit access to your deals. Read-only users can view overview data without CMBS.com accounts. Users with edit privileges can alter your deal, or they can model their own valuations. CMBS borrowers: Share your financial information with your loan servicer in electronic transfers that meet public-reporting compliance standards. Easily mange deal permissions. Increase or decrease access with the check of a box. Chat with shared parties easily and securely within our application. 90-day free Pro trial for everyone you share deals with. 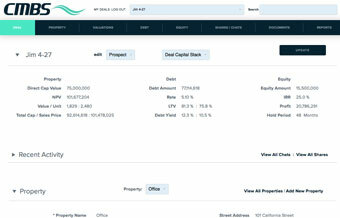 Our Deal Dashboard helps you easily compare deal images, key statistics, property information and maps for selected deals. 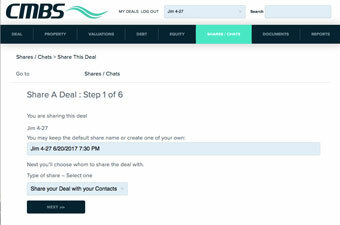 Share deals with your contacts. Manage permission levels. Send images and messages. Re-share and un-share any time.